SharePoint is a Microsoft technology that enables project collaboration through a single portal. It can be complex, but not when approached the Dummies way! This guide offers eight self-contained minibooks that examine each aspect of SharePoint 2010. Whether you're an experienced administrator or developer or you're just getting your feet wet, you'll find it's easy to locate what you need and learn to install, configure, and manage a SharePoint portal. You can dig as deeply into SharePoint as you want or need to. 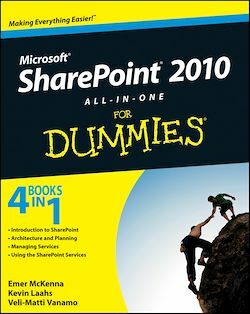 If you work with SharePoint, you'll find Microsoft SharePoint 2010 All-in-One For Dummies provides what you need to get starting and keep going with SharePoint 2010.